For those staying in Mestre, the key question is whether there is anywhere decent to run in Mestre, and is it possible to run to Venice? 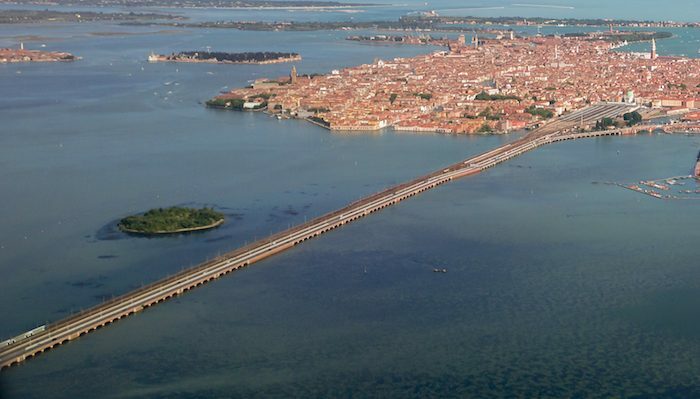 Mestre is on the mainland of Venice, connected by the long Ponte della Libertà to Venice. It is a gateway used by most who are visiting Venice, as there are car parks and train connections, as well as less expensive accommodations. Best roads to run in Mestre. There are some decent roads, with good sidewalks, especially near the main Piazza Ferretto. You can do a couple of km around the large, wide Piazza, especially when not crowded, and on some of the roads around there. Via Piave is good for running, pedestrian oriented with a wide sidewalk approaching the Piazza, and runs about 1 mile from the Mestre train station. Via Felice Cavallotti runs off of Via Piave and has a separated path, heading to the small but pleasant Parco Piraghetto. The streets around Piazzale Concordia are also quiet and OK for running. San Giuliano Park. Green space offering good views of Venice and the Venetian lagoon. Very open, with lots of paths. Can easily do 4-5 km around the park and its paths.